The Pacific Ridge Capital Partners’ Small Cap Value strategy rose 10.7%* during the first quarter of 2019, underperforming the 11.9% return of the Russell 2000® Value Index (“Index”). Over the trailing one-, three- and five-year periods, the strategy returned -9.6%*, 8.1%* and 4.1%* (annualized), respectively, compared to the Index returns of 0.2%, 10.9% and 5.6%. Since inception on April 1, 2007, the strategy has returned 10.6%* annually versus 10.5% for the Index. As long-term contrarian investors, we don’t concern ourselves with prevailing sentiment in the market, particularly when it is exhibiting erratic behavior or focused on short-term issues. Toward the end of 2018, investors’ appetite for risk fell dramatically and equity markets experienced a sharp sell-off related to concerns over the government shutdown and a trade dispute with China. We noted in our year-end 2018 Strategy Letter that these factors were likely short-term in nature and sentiment was likely to improve. Unsurprisingly, we saw the market stage an impressive rebound, even before the government shutdown was resolved. Far more important to investors with a longer-term focus is the recent inversion of a portion of the yield curve, a phenomenon that we have spent time assessing. An inverted yield curve has long been a reliable predictor of an ensuing recession (though the actual timing and market impacts can be less certain). So far, only the 3-Month and 1-Year Treasuries have risen above the 10-Year Treasuries, as illustrated in Exhibit 1. While the 1-Year to 10-Year spread does have a better track record of predicting an economic downturn, the 2-Year to 10-Year spread is still 15 basis points from inverting. It is also worth noting that the credibility of this indicator is enhanced by its duration and magnitude. A brief inversion of a few basis points has less predictive value than a sustained inversion of 10-20 basis points over several weeks. We are already seeing signs that this inversion may be a temporary blip. At the time of this writing, implied odds at the Chicago Mercantile Exchange (CME) suggest a 70% chance that the Fed cuts overnight rates at least once by the end of the year. Such an action would likely require a significant rally in long bonds to see the yield curve remain inverted. Although the current market expansion is approaching a decade in length and we recognize the inevitability of a maturing business cycle, a recession call still seems premature. The Small Cap Value strategy underperformed the Russell 2000 Value Index by approximately 120 basis points for the quarter. From a sector standpoint, the strategy’s performance in Industrials contributed approximately 110 basis points of excess return compared to the Index. However, performance in Materials, Consumer Discretionary, Financials and several other sectors detracted approximately 230 basis points versus the Index. There was a slight size-bias headwind during the quarter, as larger companies in the Index outperformed smaller ones. Companies with a market cap over $750 million in the Index gained 12.3%, versus a gain of 10.7% for companies with a market cap below $750 million. The strategy had 70.8% of its holdings in companies with a market cap below $750 million, compared to 19.8% for the Index. Strong performance of unprofitable companies provided a modest headwind during the quarter, as those firms in the Index gained 18.4%, compared to a gain of 11.7% for profitable companies. The strategy had 0.3% of its holdings in unprofitable companies versus 6.4% for the Index. The Industrials sector had the highest weight in the strategy at 28.7%. It also had the greatest overweight compared to the Index at 12.6%. The strategy’s holdings in the sector returned 14.8% for the period, compared to a gain of 9.4% for the Index. The greatest contributor to performance was Barrett Business Services (“BBSI”), with its shares returning 35.5% during the quarter. BBSI is a leading human resource management and staff leasing provider. Its stock price rallied leading up to its earnings report, after a sharp sell-off during the fourth quarter of last year. The company is increasing revenue and operating leverage while continuing to organically grow earnings at a double digit pace. Navigant Consulting (“NCI”), a management consulting firm, was the greatest detractor to returns in the Industrials sector, with its shares down 18.9% for the quarter. While NCI reported earnings that met estimates, the stock sold off on the company’s guidance that was below analyst expectations. Management is refocusing the business toward health care managed services, which they feel has better long-term revenue growth prospects. These contracts tend to be lumpy, but have the potential to drive steady margin expansion as the company leverages their existing infrastructure. Financials was the second highest-weighted sector in the strategy at 28.1%, compared to the Index at 29.0%. The strategy’s holdings in this sector returned 6.7% during the period, compared to a gain of 7.9% in the Index. The greatest contributor to performance was Sterling Bancorp (“SBT”), with its shares returning 46.0% during the quarter. SBT, a Michigan-based community bank, saw its shares recover this quarter following a sharp sell-off last quarter. The bank caters extensively to the Chinese community, so macro and trade concerns in that segment impact the bank’s outlook for loan growth. To counter the sell-off, management initiated a buyback to help support its stock price. The bank remains highly profitable and has minimal credit issues. First Choice Bancorp (“FCBP”) was the greatest detractor to returns in the Financials sector, with its shares down 2.3% for the quarter. FCBP is a well-run Southern California community bank with clean credit, a solid deposit franchise and ample loan growth opportunities. It was added to the strategy with a starter weighting in late February. Given the sizable discount between price and value, we will likely continue to add to the position. Information Technology was the third highest-weighted sector at 19.9%, compared to 10.7% in the Index. It returned 17.1% during the period, compared to a gain of 20.0% in the Index. Insight Enterprises (“NSIT”) was the greatest contributor to returns in the sector, with its shares returning 35.1% for the quarter. NSIT, a technology solutions provider, reported revenue in line with expectations. However, EBITDA easily beat estimates as the company pivots its business toward higher-margin solution offerings and systems integration. Cohu (“COHU”) was the greatest detractor to returns in the sector, with its shares down 7.9% for the quarter. COHU, a manufacturer of semiconductor test and inspection handling equipment, reported another earnings miss during the quarter due to softening demand in the mobile handset market. COHU’s shift to the mobile phone market has increased volatility for the stock, thanks in part to the slower rate of cell phone growth in China. The company’s recent acquisition of Xcerra (“XCRA”) should help drive earnings growth in the coming year as they begin to realize expense synergies from the purchase. Pacific Ridge Capital Partners, LLC (“Pacific Ridge”, “PRCP”, or “the Firm”) is a 100% employee owned investment advisor registered with the Securities and Exchange Commission under the Investment Advisors Act of 1940. The Firm was established in June 2010, and has one office located in Lake Oswego, Oregon. Pacific Ridge claims compliance with the Global Investment Performance Standards (GIPS®) and has prepared and presented this report in compliance with the GIPS standards. PRCP has been independently verified for the periods June 10, 2010 through December 31, 2018. Verification assesses whether (1) the Firm has complied with all the composite construction requirements of the GIPS standards on a firm-wide basis and (2) the Firm’s policies and procedures are designed to calculate and present performance in compliance with the GIPS standards. 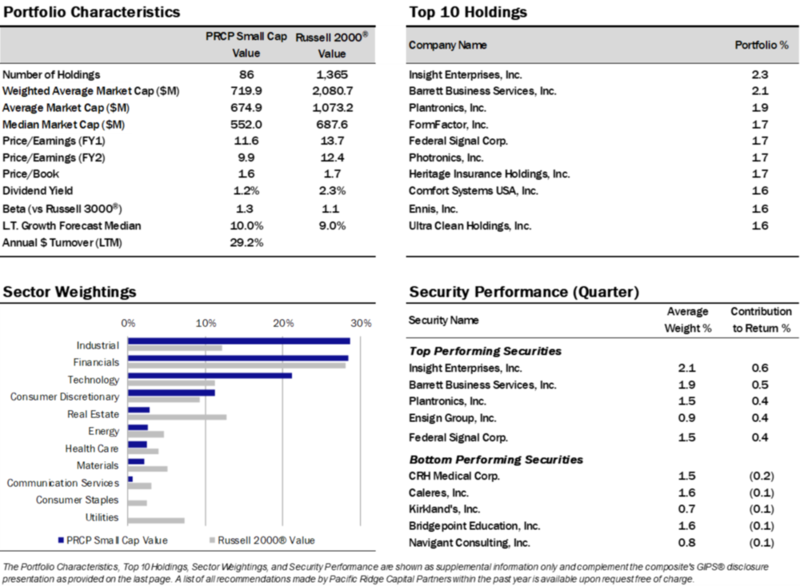 The Small Cap Value composite has been examined for the periods August 1, 2010 through December 31, 2018. The verification and performance examination reports are available upon request.